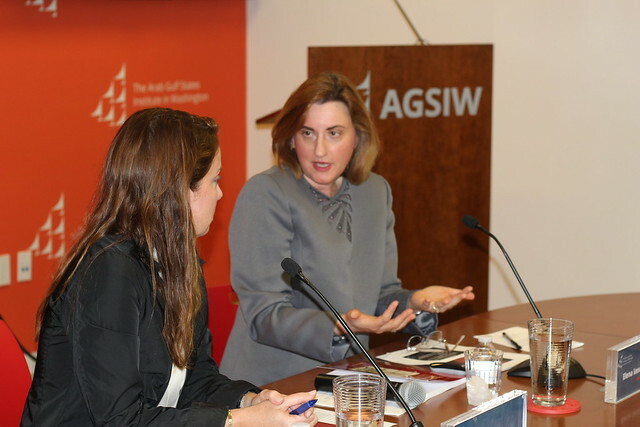 On June 12, AGSIW hosted Elena Ianchovichina, deputy chief economist, Latin America and the Caribbean, at the World Bank, for a discussion of her book “Eruptions of Popular Anger: The Economics of the Arab Spring and Its Aftermath.” The discussion was moderated by AGSIW Senior Resident Scholar Karen E. Young. In the new World Bank publication, Ianchovichina aims to understand the real causes behind what was termed the “Arab Spring.” She argues that the protests that erupted in the Arab world in late 2010 were not caused by poverty or inequality, but by the erosion of middle-class incomes and dissatisfaction with the quality of life, the shortage of formal sector jobs, and corruption. In her presentation, Ianchovichina emphasized the three main puzzles that her publication addresses. She argued that prior to the Arab Spring there was a concept that Arab countries were more stable relative to other developing countries. The countries performed well compared to other regions in the world in areas such as child mortality rates and absolute poverty. While income inequality remained moderate to low, the middle class was being squeezed. Ianchovichina stressed that the flaw in the social contract remained that the model did not provide enough benefits to the middle class even with subsidies. She maintained that the social contract is intended to address the role of the government in supporting the needy, protecting the security of citizens, and ensuring that the business climate allows job creation. The unsustainability and breakdown of the social contract model throughout the region created an environment with high risk of conflict. Ianchovichina stressed that throughout the Middle East, most of the wealth is concentrated either in state-owned companies or private companies owned by wealthy families. This creates issues in terms of incentives in areas such as innovation and expansion of the market. While wealth concentration will continue to be an issue in the region, redistribution has to ensure that people accumulate the human capital they need to be successful and engage in the labor market successfully. Ianchovichina added that there is significant evidence that many of the economies in the region were not integrated into the global economy successfully prior to the eruption of the Arab Spring. In conclusion, Ianchovichina highlighted the need for a smaller and more efficient government with more emphasis on the private sector, targeted distribution for the vulnerable and needy, and institutions that have high accountability and transparency.